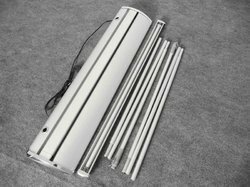 Pioneer in the industry, we are engaged in trading and supplying an impeccable range of Double Sided Roll Up. With the aid of our experienced workers, we are devoted towards manufacturing an exquisite range of Roll Up Standee. 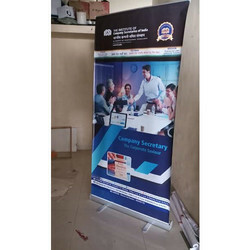 Size: 3 x 6 Ft.
Standard sized alluminum standees are portable and sleek looking, which makes them a sought after medium to install advertisement or information at Conferences, Retail stores, Private functions, Exhibitions, Events. - Mini Plasto - mini portable table display, sleek design, easy roll, comes with small comfortable bag.